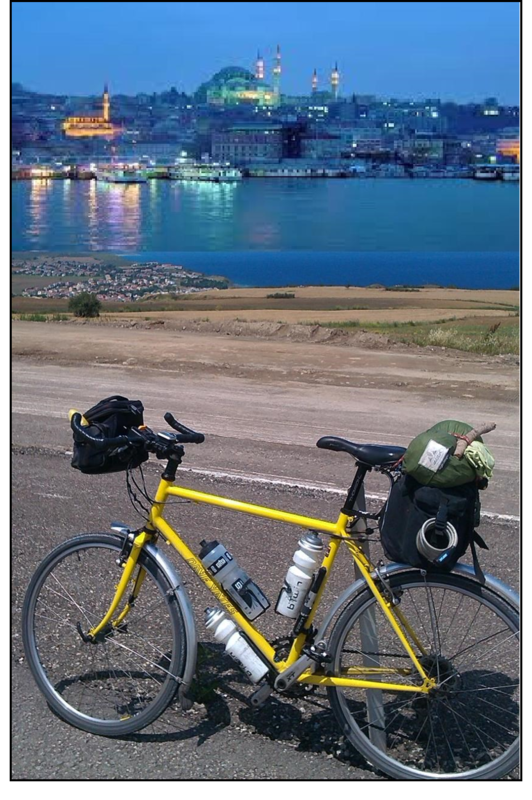 I will be telling the story of the thrills and spills of my 2,500 mile cycle trek to Istanbul at the Mandeville Hall, Kimbolton, Cambridgeshire on Friday September 26th at 7.30pm. Entry is free, and refreshments will be available. 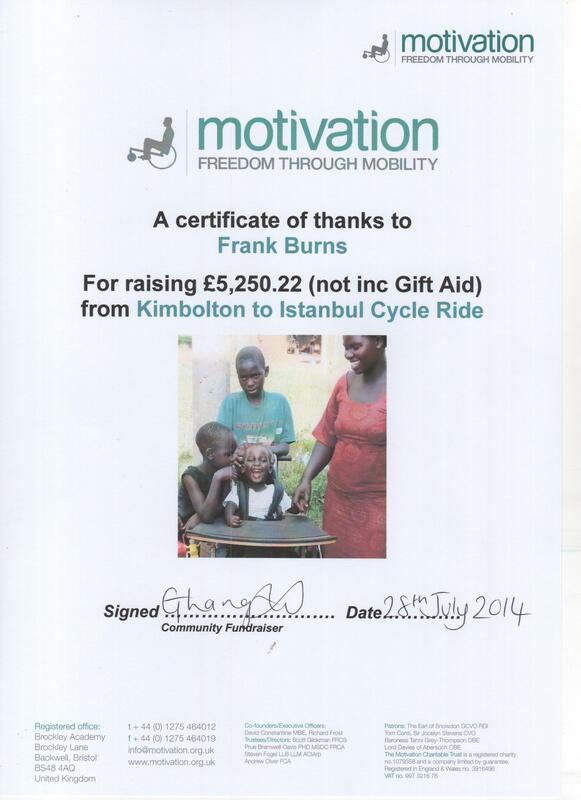 I may have pedalled the miles to Istanbul but my wife, Jenny, ensured that all the donations promised have been collected; that the accounts were meticulously kept up to date; and that the tax rebates via gift-aiding have been secured for the charity Motivation (motivation.org.uk). Having that kind of back-room support freed me up to concentrate on the logistics of the expedition and, at no point on the journey, did I fear about our financial accountability. I’m not only grateful for her unswerving support on these adventures…….but she also cuts my hair for free! Last night we met with one of the directors of Motivation, Richard Frost, his wife Sarah (who also works for Motivation), their children and cousins, and we sat down to a veritable feast prepared by Richard’s mother Mavis. It was a great opportunity for us to meet some of the people at the heart of the charity’s work, learn a little more about its background, its progress over 25 years, and where it is going in the future. Although we were delighted to have surpassed our target of £5000, we knew realistically that this was but a drop in the ocean, especially seen in the context of the huge potential for further expansion in the developing world. Wheelchairs are, quite honestly, life-savers for those who are immobile and unable to support themselves, but it also happens to be an aspect of humanitarian support that is neglected by many of the big charities. Motivation works hard both with local government projects and with big-name charities, to improve the provision of affordable wheelchairs for the disabled. However, it was heartening to know that our small contribution will help to provide 38 wheelchairs, the materials for which will be sourced locally by each of the projects, and will be built by specially trained staff in each of the countries. Much more than simply providing wheelchairs, people are empowered to build their own, thus ensuring continuity for each of the projects. If you contributed to this, I thank you sincerely. Your donation has gone to a very good cause. Shall I compare it to a……..
Amongst the myriad trivia that filter into a long-distance cyclist’s empty brain are comparisons. They range from: comparing the steepness and elevation of a climb to already familiar climbs at home or in other parts of the world; the distance to the next way-point compared to a similar route at home…….and many more. As I day-dreamed on the plane back from Istanbul, my mind played on some very interesting speed comparisons between different modes of transport. These have been so consistently correct, that they have become almost infallible guides to my potential progress when I am planning a new venture. 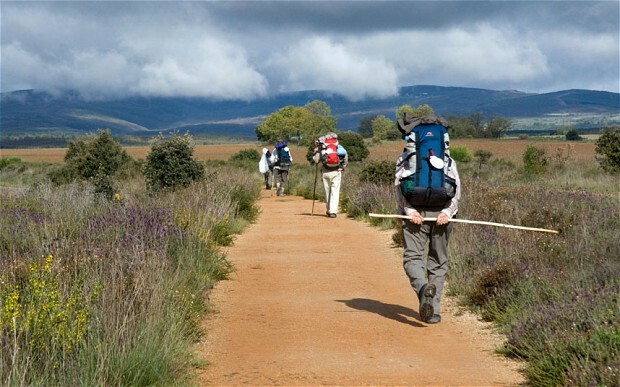 When I cycled from my home to Santiago de Compostela, in NW Spain, I met hundreds of walkers going in the same direction. Compared to an averagely fit walker, I would easily cover in 1 day what he/she covered in 4/5 days. So when I said goodbye to a walker, I was confident I wouldn’t meet him/her again……unless they cheated and used public transport (and that did happen!). When I compare my speed with that of a car, barring the 80 mph done by many along motorways, what a car generally covers in 2 hours, would take me a whole day in the saddle. So the differential is much the same as between a cyclist and walker. However, when I compare my meagre progress on the bike with that of a passenger jet, the differential takes on a different complexion. Had I gone directly to Istanbul, without any city stops, the journey would have been a comfortable 4 weeks. My flight back to London was 4 hours…….ergo……? Yes, you’ve got it. In the time it takes you to have an aperitif and eat your airline meal, I will take a full week to cover that same distance. So, the next time you are flying to a holiday destination, staring aimlessly out of the cabin window, look beneath you to the land below (difficult, of course, if you are flying over water!) and try to imagine yourself on a bicycle 10,000 feet below, spinning away trying to keep pace with that jet airline above you. One cyclist I met, riding from Germany to the Black Sea, was hoping to hitch a lift on one of these back to Germany…how cool is that? However, there was one motorised form of transport I could outpace. 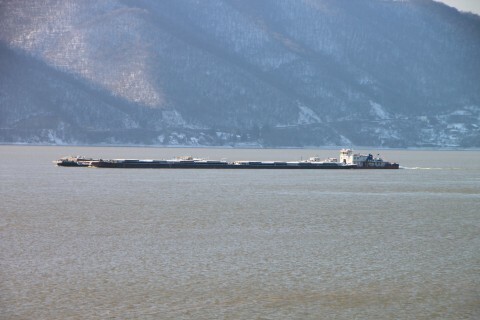 The days I spent riding along the banks of the Danube, I encountered dozens of river cruisers and cargo boats plying their routes up and down the river. If I edged my speed up above 25 kms per hour, I found myself gradually overtaking these enormously long vessels……..nothing better for lending further power to those pedals! Adjusting from the ‘high octane’ experience of riding across the continent, to the more sedentary experience of being back at home, requires both a mental and physical adjustment. On the 4 hour flight back home, unusually sitting in a window seat, my mind drifted over many aspects of the last six weeks, trying to re-visit various sections of the route, the places I stayed in and, above all, the people I met. 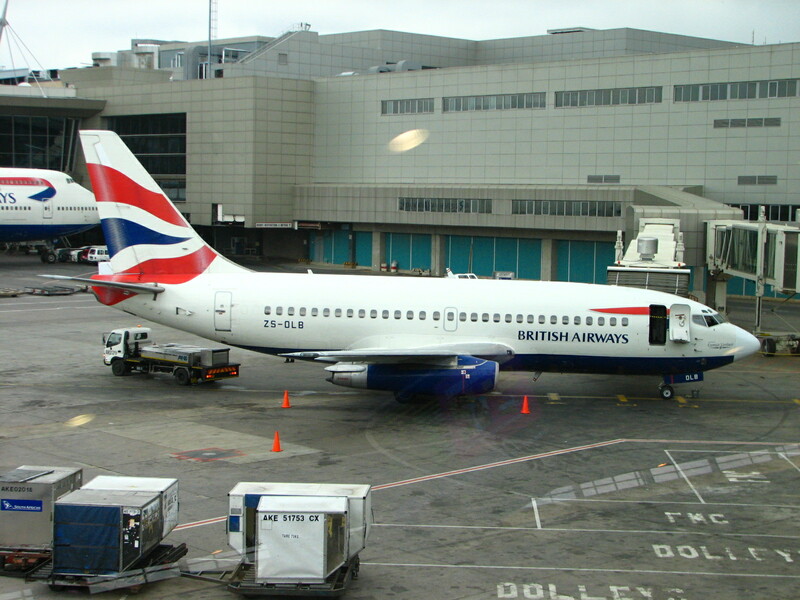 Perhaps the most unnerving moment of the entire six weeks came as we approached Heathrow airport. Coming into land, the approach was entirely normal, but about 20 metres above the runway, the jet engines ignited once again, and we swooped heavenwards. The climb was so steep that we were all thrust backwards into our seats, and you could hear gasps and whimpers around the cabin. We eventually levelled off and began to circle around for a fresh approach, when the captain came on the PA system and said: “Well, ladies and gentlemen, that was interesting, wasn’t it? It would seem that an Airbus hadn’t quite cleared the runway, so we’re having to make a fresh approach. So sit back and relax, and we should be safely on the ground in 10 minutes”. I heard one or two sighs of relief……. As I was emptying my bags at home, I came across the personal cards of several people I had met, but in one or two cases, I struggled to remember who they were, and where I had met them. Fortunately I keep notes of every day’s ride, so dipping into my ride journal will probably solve a couple of mysteries. 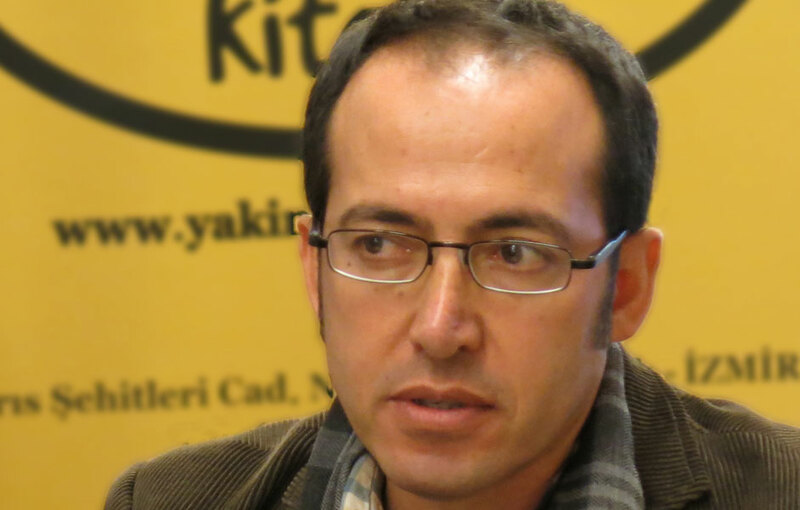 On my last day, I met up with a friend of a friend, Burhan Sonmez, a Turkish Kurd, who has shifted from practising law to becoming a full time writer. 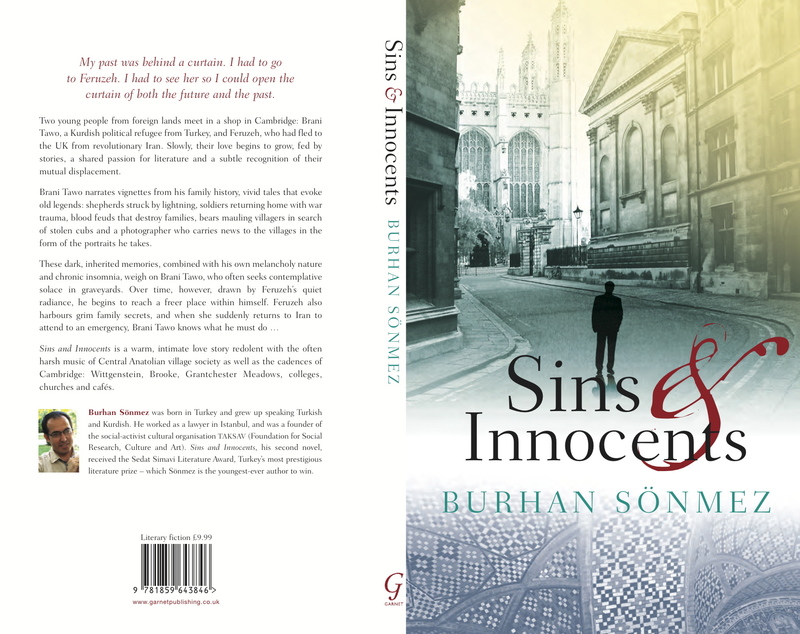 He recently won the most prestigious literary award in Turkey (the equivalent of our Man Booker Prize) with his latest novel Sins and Innocents. He took me to Taksim Square, the scene of some recent major demonstrations against the regime, where several people were shot and thousands injured and imprisoned. He has a very interesting story to tell…….but more of that in another post, when I have had a chance to read his book. Around the village I am greeted by many and sundry who welcome me back, ask me for a potted history of the ride, enquire where my next adventure will take me, and sometimes offer a donation for the charity I have been supporting. It is good to be back at home, with my wife, and amongst friends. And like so many things in life, we don’t fully appreciate them until we have been without them for a while. Your home environment and your daily routines take on a different hue; the comfort of your bed feels different, somehow; returning to your normal diet is like being reunited with your favourite armchair; turning on the 10 o’clock news to see the familiar presenters means that little has changed in your absence. We all need a bedrock in our lives. The only thing or person who has changed is, of course……you. When a traveller goes back home after his adventure, what must he do………? Of course, he must go out and find a few tokens of love for his dear long suffering wife, and his cheerleader daughter. But for this traveller it means engaging in an activity as foreign to him as football: shopping. Both sports seem to entail a lot of pointless running around, and frequently to no effect. and walked into a vast indoor network of ‘snickets’ and ‘ginnels’ of nearly 5000 touting stallholders, I knew I would rapidly sink into a state of complete paralysis. I mean, I have a problem deciding what to buy when the choice is any one of two, so when that field of choice expanded to several thousand, and every stallholder was giving me a “Hello, how are you?” as their prologue in the battle to be the first to get my money, I knew I was in trouble. Solution? Go and have a bite of lunch to think about it. Result? Well that would be telling, wouldn’t it? But it did clear the mind, and this intrepid shopper marched straight back into the warren, did his business, and then, of course, couldn’t find his way out. Once you are in the thick of a huge bazaar like this, there is no way of following a breadcrumb trail to get back out. Like being in a thick forest with no compass, you simply keep on walking until you spy daylight. Once out into the open, I had no idea where I was, and the city map was of no use. Solution? I switched on the GPS on my phone and followed navigational instructions, which got me out of the warren of streets and back to the hostel. And no, I didn’t buy this “tayt pantalon”……much too like the tight drainpipes of the 1960s. If you have followed some, or all, of this journey to Istanbul, thank you for your company. Apart from those who click ‘like’ or leave a comment, I don’t know who you are, but I really do appreciate your interest. Having readers inspires the writing and sharing, and that is what non-commercial blogging is all about. …so glad I had a fresher pair of legs to tackle it. When I got to the port, I asked directions to the ticket office from someone who spoke very good English, and it turned out he worked as a chef (in an Italian restaurant, of all things!) in Camden Town. One of his family party had dropped out from their trip, so he sold me his spare ticket. Otherwise I wouldn’t have got on board…..this high speed catamaran was completely sold out, everyone carrying suitcases on this passenger-only ferry, so I was surprised when they let me on with the bicycle. And the 2 hour trip across the Marmara Sea cost the princely sum of £4 (5 euros). You can’t get much cheaper than that. And disembarkation was perfectly situated for the historic centre of Istanbul. Within 20 minutes I was checking into a Lonely Planet recommended backpackers hostel, which promised an open rooftop terrace for sleeping. I have very pleasant memories of visiting Athens when I was a student, and sleeping on an open rooftop overlooking the illuminated Acropolis. It was magic. …I will see it from my bed, illuminated, at wakeful moments during the night. Now let me ask you a question: is it better to pay £7 (8 euros) per night B&B for this, or pay ten times the amount to be cocooned in an air conditioned hotel? And to boot, backpackers make great company. They are invariably young adventurous people, who come from around the globe, and have interesting stories to tell. Of course, I don’t yet know if I’ll have the company of a snorer tonight…..but it’s a gamble worth taking. When I asked the young lad on reception about where to store the bike, he said “no, problem, I’ll help you carry it up to the balcony in your dorm”…..that’s up three flights of a spiral staircase! (As I pen this post at 17.10, a few dozen mosques in the vicinity have just started their call to prayer, and the combined wailing is reverberating around the city). So, another end to yet another journey.I exceeded my calculated estimate by over 1000kms….but I’m not complaining. I got to see a few places that weren’t on my original itinerary, and I wasn’t disappointed with any of them. I also now have three full days in Istanbul, a prospect that gave a degree of urgency to the daily mileages. And I know I will not be disappointed. This is a city I’ve been longing to visit for a long time. If you want my fleeting impressions of Istanbul, stay with me. The first day in over 5 weeks that I did not climb on the bike…..how strange…. In fact, I climbed on a bus to go the very hilly 5kms into town….again, very strange. Everywhere I go, I feel people watching me. They obviously think I’m a foreigner….I’ve no idea why…the way I dress perhaps? People simply come up to me to try out their bit of English….and it’s usually the same 4 or 5 questions….you know, the ones they always test in an oral exam (I’m an ex-language teacher, so I know all about these things). In my first few days in Turkey, I got the impression everybody had a fixation about age. Everybody was asking “How old you are?”. Then would come “Where you from?” and “What your name?”. And that’s when most of them are done….there’s nothing more to explore. One guy, who spoke a little more English, told me that Turkish men of my age just sit down and drink tea all day….and sometimes they play backgammon (or what I call sitting in the waiting room for the hearse to arrive). …and he was excited about it. It was great to see. But where did he and his mates get the idea from? For sure, there are no role models in Turkey. …no ordinary chap this….he is an expert tile restorer, and had been commissioned to repair the damage of centuries of wear and tear to the mosque interior. For half an hour, I had my own personal guide, rounded off with a glass of tea in his studio. following the script, from right to left, with his finger. I was quite moved by his spontaneous sincerity….and afterwards, he told me the Koran was like a brother to him. When I entered the Grand Mosque, I found this little boy pure entertainment. …and again, security chased him away until his mother caught up with him. I loved it. ….they tied string across the walkway, like a trip wire, in the hope you would give them a few coins so as not to trip you up. And amazingly, I saw people giving them money. only her eyes visible, watching her children playing in the pool. As a non-Muslim, and a foreigner, I failed to understand that situation. But then there is much about the Turkish way of life that I have yet to understand. Having been rudely awoken this morning at 4.30am by the strident call to prayer by all the town’s mosques (has sleep gone out of fashion in Turkey? ), I decided to make an early start, and catch the cool of the morning hours. So at 7am I set off with the idea that this leg would be about 115kms….but somehow it morphed into the biggest day of the journey so far. For ‘metrically-challenged’ Brits and Americans, it was 112 miles which, on a day with troublesome winds and temperatures reaching 28 degrees C, and the fact I’ve already put 2,500 miles into my legs, was little short of surprising. With the heat and the hilly terrain, I had to pay special attention to hydration, and my salt intake. So crisps and salted peanuts have featured strongly, as have some 5 litres of mineral water. To add insult to injury, when I got to Bursa, drained and exhausted, I had to do battle with an Armageddon of traffic going into the city, and to get to a hotel, I had to climb a 15% hill to get into town! Where’s the justice in that? Today has effectively been the last full day on the bike. Tomorrow I’ll spend the day in Bursa, and on Friday I will catch a ferry into the heart of Istanbul, neatly avoiding the notorious traffic going into the city, and giving myself a better chance of orienting myself before I look for a room. I will then have three full days in the city which will, of course, include time for preparing my bike for its passage on a British Airways flight on Tuesday. But for now, I am exceedingly glad to give my btm a rest. It was telling me today “enough is enough!”. So I will heed demands from the nether regions and do my sightseeing on foot tomorrow. …the ubiquitous and cheap beverage of choice. I’m trying to imagine people in the UK going out for a “session” and ending up drinking ten glasses of tea! 1. The water bottle, for squirting water directly into the dog’s face (apparently very effective, if you can aim straight); 2. Red pepper spray which, apparently, is also good against bears! 3. The dog dazer….sadly, I don’t think it really works…..or the dog’s I tried it on simply weren’t listening; 4. Finally, the good old stick. Now I haven’t had to use any of them, because only one dog, in Bulgaria, has made a half-hearted attempt to have me for breakfast. All the other strays I’ve encountered have been too underfed and lethargic even to raise a bark. But let me tell you about the Hunting Shop assistant in Vienna who tried to sell me a taser gun. Because he suspected I doubted the effectiveness of pepper spray, he took me down into mysterious bowels of the basement, where all the serious firearms were displayed. He told me Austrians are allowed to carry handguns, and he said for only 89 euros, I could carry the ultimate in dog scarers, and feel entirely safe. But when I questioned him about the legality of tasers in other countries, I ended up telling him a couple of pepper sprays would be quite sufficient. But…..don’t let any of this put you off cycling in eastern Europe. Things are never as bad as the ‘Tripadvisor’ reports make out to be. A visit to the Gallipoli War Memorial Park was still pending. I couldn’t leave the area without spending a day discovering the finer detail of this most painful chapter of British history……not just reading about it, but by being physically present in the places where this campaign occurred. …and several school parties were learning about the military action which resulted in the birth of a new nation, the Turkey we know today. It wasn’t just Turkey that was transformed…. ..this ANZAC cemetery and memorial will testify to the huge sacrifices made by Australian and New Zealand soldiers, so much so that it led to a break with mother country, and both became independent nations, making the date of their landings on the peninsula ANZAC day (April 15th). In Turkey, the annual day of celebration is March 18th, the date they foiled a naval invasion by the Allies. The chief weapon used to prevent invasion was the mine. The strait is so narrow that once a ship was blown up, it caused confusion amongst the others, and the scramble to back off caused several other ships to be destroyed. Hundreds were killed……a shameful military campaign whose objective was to invade a sovereign nation. …we hailed each other across the vast empty space, but once his 5 words of English, and my 3 words of Turkish, were used up, we said ‘gulegule’ (goodbye). …..perfect for unwinding from a busy day. You might suspect that I am beginning a gentle wind down from this trek…..you may be right, but there are still a couple of full day rides to do, as I head more directly for Istanbul, some 350kms from where I am now. Long cycle treks always throw up a plethora of statistics, and my memories of past trips, going back over 30 years, are a mixture of routes, places, average daily distances, people….and much, much more. I remember back in 1982, I took 5 senior pupils on the UK Land’s End to John O’Groats route, a distance of over 1000 miles/1600 kms, and we calculated how many Mars Bars and pints of milk we had consumed on the journey. We even worked out some equivalent mpg for cyclists, based on Mars Bars. It was a silly memory marker, but it has stayed with me all those years. On my solo treks these days, as much as I am enthralled by the landscapes, cities and the multiple distractions of travelling across a country or continent, to put it in crude GPS language, the most memorable ‘waypoints’ tend to be the people I meet. Every encounter is serendipitous, and each one enriches my life in some small way (at least). Although they really didn’t mean it, I was given effusive invitations to visit them in their home country of Venezuela. …he from Croatia, and she from Romania….and their common language was English. But interestingly, when I spoke a few words to Simona in Spanish, she understood me perfectly. Romanian, you see, is a romance language, so shares a lot in common with other romance languages. …another lone traveller, who was returning home to his native Taiwan (though he was born in the US) overland by public transport. Unfortunately, his bank account had run low, so he’s going to work a few months on an MSC cruise ship to finance the rest of his journey. …and he gave me a clearer understanding of several aspects of Turkish history, especially concerning the varied Eurasian ethnic roots of many people in Turkey…..the result of the centuries-old blending of Turkics from the far east with Slavs from the west. All fascinating stuff. And to round off, I insert this for my dear wife Jenny, inveterate lover of poppies……these were growing amongst the palace ruins of Troy. So plan B is in operation….not to go directly to Istanbul, because my flight home is not till June 17th, but to go south in the direction of the Dardanelles, scene of the infamous Allied defeat in 1915, better known as Gallipoli. which meant that all Turks killed in the action, or died as a result of injury or illness, were automatically declared martyrs. The defeat of the Allies was momentous for Turkey….it provided the foundation for developing their nation state, led by the indomitable Ataturk. En route south, I caught up with Jacques from Belgium…. Without knowing it, we had been tacking a similar course through Europe, but he was hoping to get to Jerusalem. Not via Syria, of course, but via Cyprus, where he will have to persuade a cargo ship captain to take him to Haifa. A retired lawyer and veteran of long distance walks, like me he is convinced of the value of always travelling solo. When you ride in excess of 100 kms every day through open countryside, you are going to stumble across many interesting situations. the Aegean….which reminds me of something I read in the comically worded tourist brochure in Kesan (you know, the place that never gets any tourists?). In the same sentence it mentioned both the Mediterranean and the Agency…it took me a while to realise that it was probably a bad Google translation of ‘Aegean Sea’….! So now, for two nights, I will stay in the bustling holiday town of Canakkale, and tomorrow I will speed the 40kms down to Troy…… luggage free! Changing country as often as I have in the last few weeks has meant that my journey has developed new twists and turns across every border. No two countries are the same, but the difference between Turkey and its neighbours to the west is somewhat acute. (the landscape and agriculture have little to offer the tourist) so few people speak any English, and seeing a cyclist wearing brightly coloured lycra means I will not escape their attention. Dozens of truck drivers have hooted and waved; people by the roadside waved and shouted a greeting; whenever I stopped, people would greet me with the only word they knew in English: “welcome”. Quite frankly, I have been touched. My first refreshment stop was at a village bus station. Omar was sitting waiting for a bus, and greeted me in English. He is a farmer, with 40 hectares in Turkey and 500 in Romania, growing rice and sunflowers. When I asked how a farmer came to speak good English, he said he had worked amongst tourists on the coast. invited me to join him for tea. A trained teacher, he too makes his living from farming, and he gave me my first lesson in Turkish. I now have half a dozen basic phrases, all written down phonetically. and ordered several glasses of tea for me. We didn’t have absolutely any language in common, but nobody cared. One asked to become a friend on Facebook, and another was so excited to be photographed with an English cyclist, that he wrote down his address and pleaded that I send him a copy of the photo. All quite extraordinary, really. When I got to my destination for the day, I asked the first passerby for the Information Office. Well that started a sequence of events…. He took me into the police station (there was no information office because no tourists come to this part of the country) where a young gun-carrying officer guided me to the Mayor’s office (and in both places I had been offered tea! ), where I enjoyed the attentions of four members of staff who wanted to help me. All I wanted was a city plan and to be told if there was a campsite (which there wasn’t). But for them, this was a major happening, pointing Kesan towards a future that would see growing waves of tourists coming to the city. (I didn’t want to say that I wanted to stay the night and spend virtually nothing….but I think they could see that anyway). In the end, I was guided, personally, to a cheap but very comfortable hotel (again, only £12 B&B) including wifi. So tomorrow, I will head down to Gallipoli, and I am sure I will be treated to an undiluted Turkish perspective on a campaign that saw the deaths of thousands of British and Commonwealth troops. and the atmosphere is one that I recognise as a hispanophile….it is a lively, friendly, hustling and bustling Mediterranean environment….and what a contrast to Hungary, Serbia and Bulgaria! No sooner had I checked into a very smart, but cheap pension (only £12 for B&B) I headed out to visit Edirne, a city that bristles with mosques, all of them as big as cathedrals. I entered the central mosque, shed my footwear, and dared to join the men at their prayer meeting, expecting all the while to be evicted by the lady security guard (yes,all the mosques have female security, interestingly). But no, my presence didn’t seem to raise an eyebrow, and I sat at my leisure and observed the highly ritualized actions and reverences performed by all the men in unison. (The ladies, of course, look on from behind latticed partitions). Afterwards, I was invited by these four Syrian lads to sit with them (mosques are also informal meeting places where men gather to relax and chat). They were eaten with curiosity about who I was and why I was there. They are all refugees from the civil war, and have fled Syria with their families. Their hope is to get to Scandinavia and find work. Only one of them spoke a little English, but we sat for half an hour making halting conversation. They all have an uphill struggle ahead of them, but they seem to be holding onto the dream. Fascinating, too, was to watch this man perform his ritual washing at the holy fountain. Tomorrow, rather than head straight to Istanbul (which is only 240kms to the east), because I have kept to my schedule since leaving Kimbolton, I have some flexibility now to go off at a tangent, and visit Gallipoli and Troy to the south. There are some days on a long trek where the only positive thing you can say is…..at least it got me a day closer to my goal…. Yes, it has been one of those days (in stark contrast to yesterday). What can I say about it? Well, it was 120kms of featureless, busy highway, where the majority of the vehicles were heavy trucks heading for Turkey. To add insult to injury, I had wished the BBC weather app had got it all wrong…..but no, it was spot on. It rained heavily for 80kms, so the conditions were as bad as I can ever remember them, on any trek. The town of Haskovo couldn’t come too soon. …now you know how to spell the name of the global burger-maker in Bulgarian……well, not really true Bulgarian, which would be written in Cyrillic. Talking of which, the Bulgarians are much less forgiving (than the Serbians, for example) about us westerners understanding their language. Very little of their signage and instructions etc. are rendered in the Roman alphabet. I’ve carefully studied my Cyrillic crib sheet, time and time again, but I couldn’t pass a test in it. Anyway, in 24 hours time, I’ll be struggling equally with a completely different language….and no, I don’t have a crib sheet…. the one that had some knowledge of English kept keying words into Google Translate on his phone. When he asked what I did for a living, I told him I was retired, but he didn’t understand….so he handed me his phone to key in the word ‘retired’. When he finally understood, he looked at me and scratched his head, saying something in Turkish to his friend. They were both student engineers studying in Sofia, but since neither had a knowledge of Bulgarian, I kind of wonder how they managed. Using my tent has become an exception these last few days. Both Serbia and Bulgaria simply don’t have a camping culture. I was told by Atenas, a Bulgarian, that it’s an inheritance from their communist past. But I loved the comment made by an Aussie back in Austria. He and his wife were riding two weeks of the Danube, and when I asked if they were camping, he looked at me shocked, and said: “look my wife thinks that ‘camping’ is moving down from 5 star to 4 star!” I said to her: “you need your fluffy towels at the end of the day, then?”. She nodded at me sheepishly….. There were two possible routes out of the capital going in my direction: one shorter and on the flat, the other longer and climbing over the Balkan mountains. Now which would you choose? (oops it’s upside down as well. Never mind) but if you look at the road going SE (top left now), you will see that, at the ring road, the road coming out of the city suddenly changes to motorway, then 6kms later it feeds onto a highway that cyclists can use. I asked advice at the Information Office, and all they would say is: it is illegal to cycle on the motorway….but everybody does. You take your chance…..What would you do? at an altitude of 1400 metres (about the height of the UK’s highest mountain, Ben Nevis), followed by a scarily fast 10kms of descent…..my wheel rims were burning from the braking. But it was exhilarating. and brought my climbing speed down to just 10kph. On the descent I was hitting 55kph, and would have been faster but for the dangerous condition of the road. The road up from Sofia had been carefully maintained for the people of the capital to access the skiing slopes. The road down the other side was a different story…..
What I observed was a stark contrast with the apparent affluence of the capital that I had just left. The Turkish border is now less than two days away, and I am beginning to observe a growing Turkish ethnicity in the people of SE Bulgaria. Sofia, however, is rich in many other ways. Once I had begun a cycle of visiting religious buildings in the city (which are usually open and free to enter), I found myself emerging 7 hours later, my head spinning with the extraordinary religious history of a city on the frontier of four major religions (and here I separate out Orthodox from Roman Christianity). built once the Russians had driven the Ottomans out in 1875. The Sephardic Jews, you may remember, had been expelled from Spain by the Inquisition in the 16th century, and many had fled to eastern Europe. I had the pleasure of meeting an American family of eastern European Jewish origin, and they shared a few very interesting reflections to fill the gaps in my knowledge. being the oldest Christian temple in continued use in the world, dating from the time that Constantine converted to Christianity in the 4th century. Well, it’s been a day off the bike, but the sightseeing brain muscles have been in overdrive. A great city to visit, and even better when the museums are open. So, back on the road tomorrow, heading towards the border with Turkey. May that friendly westerly wind continue behind me! Some events and experiences have a one-in-a-million chance of happening. Some 600kms from Pirot, in the NW of Serbia, I checked into a small hotel, one of many in the city of Novi Sad. When the receptionist learned of my destination, she exclaimed: “Oh that’s interesting. A Dutchman stayed here a few weeks ago, and he was walking from Vienna to Istanbul. Maybe you’ll meet him”. And guess what? I did…..
As I was relaxing after supper in a small hotel 30kms from the Bulgarian border, in walks Christian and (like most solitary travellers) he immediately engaged me in conversation. “You look like a cyclist”, he said. When he eventually told me his destination, I said “I know about you already…..unless of course there are two of you!”. When I told him where and when I had heard about him, he (and I) was amazed. What are the chances of that happening? He is doing a relatively new transcontinental trail (http://www.sultanstrail.com) which starts in Vienna, marking the most westerly point reached by the Ottomans as they expanded their empire west across Europe. At 30kms a day (a very good walking pace) he is taking 4 days to cover what I do in a day. I reckon his achievement and staying power are far more remarkable than mine, and it is always inspiring to meet such people. If you read this, Chris, “may the wind be ever at your back!”. …and once again back into the hallowed environment of the European Union (though not everyone would agree with that). …who also happened to be called Frank, and he hailed from Perth in Australia. Two months into a six month journey, he told me he had simply walked away from his job as a town planner, finding out in his current simple travelling life style how long he can go without depending on a monthly salary. We only shared 25kms on the road, because he was heading for Macedonia, but in that time we sorted out most if the problems of the world. I tell you, all leaders of state should be long distance cyclists…..we give ourselves time to think as we pedal the miles, and our simple life styles would be a credit to any environmentalist. We parted company sharing thoughts on how people can extract themselves from the narrow corridors of their lives. I tell you we cyclists have got it all sorted…..
but it provides a lock-up for my belongings while I am visiting the city tomorrow. and since I haven’t (yet) had to use any of the cushioning extra time I allowed for misadventure, illness or mechanicals, I can approach the final kms with a degree of relaxation, and the opportunity to make the odd diversion.